As the price of copper rises and the economy continues to turn, the unfortunate theft of air conditioners has risen across Texas. At Rustic Fence, our number one goal is to keep you and your assets safe, and it was only a matter of time before we found a solution to keeping your conditioner safe. 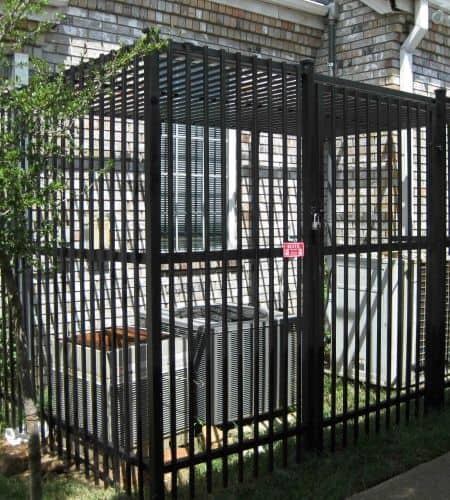 Our iron air conditioner cages work to provide a spacious but visually non-obtrusive environment where your air conditioner will be kept safe from thieves, vandals, and other forms of damage. All of our air conditioner cages are made from the highest grade of commercial iron to ensure that they last against any elements. With our help, only you or an authorized person will be able to access the air conditioner on your property. We have installed our cages for numerous home and business owners throughout Arlington, TX. Air conditioners are an expensive yet necessary part of living in Texas, and our cages will ensure that you can keep your investment without any outside risk. Our cages come with full warranties and quality assurance guarantees so that you can rest easy know that your conditioner is safe. If you have any questions or would like a free estimate, contact us at Rustic Fence today to get started! If you want to be protected from outside forces, call Rustic Fence today for a free estimate!